The US Open conducted its first women's singles championship in 1887. From 1887 to 1974, the competition was held on grass before being held on clay courts between 1975 to 1977. From 1978 onwards, the tournament has been conducted on hard courts. The format in the women's game has undergone a sea change since the early days. In the early days (until 1918), the event was held in a knockout format (All - Comers). The format was officially called 'Challenger Round' and it featured a knockout format where the winner of a single-elimination phase squares off against the previous year's champion, who plays only that one match. It is noteworthy to mention that the US Open was the first Grand Slam to award equal prize money to women athletes way back in 1973 itself. All other Grand Slams did so only at the turn of the century. Women athletes belonging to 17 different nations have won the US Open since its inception with USA firmly ahead, with its athletes bagging 67 titles, including 25 in the Open Era. In the Open Era, Chris Evert and Serena Williams lead the charts with 6 title wins each. 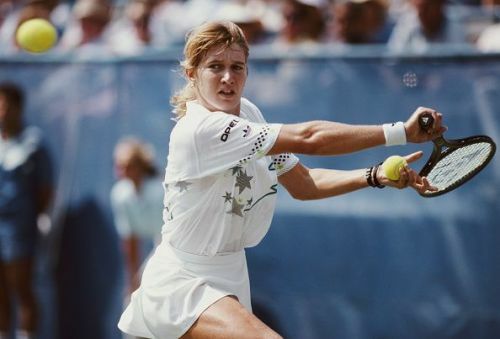 Steffi Graf won a mighty 22 Grand Slam titles and held the World Number 1 ranking for an all-time longest spell of 377 weeks. But her march towards the path to greatness began in the year 1988. Graf started the year in stupendous fashion, grabbing her second Grand Slam title at the Australian Open. What followed then was winning the French Open, Wimbledon and the Olympics gold. By then, Graf had already established herself as one of the all-time greats despite still being under 20. She came into the US Open as the top seed. She had her sights set on becoming the first tennis athlete to win the 'Golden Slam' -- a feat which is unlikely to ever be matched. Graf was in such dominating form throughout the competition that she did not drop a single set on her way to the final. In the final however, she faced her biggest test against Gabriela Sabatini. Graf won the match in a tough 3-set contest to win the US Open for the first time at the age of 19 years, 88 days.